Not only is November filled with holiday anticipation, it’s also a perfect time for reading. Why? National Young Readers Week, the Gettysburg Address anniversary, and International Games Day are all this month, and we have book activities for each of these and more! (Get the details in the free Reader’s Calendar.) Plus you have a chance to win 30 copies of the book of the month for your grade level. The picks for this month are I Love My New Toy!, Abe’s Honest Words, and Sasquatch in the Paint. Click here. Then get ready to celebrate some more with Judy Moody and Stink. This newest book of the series, The Wishbone Wish, centers around the fall and Thanksgiving activities kids love plus includes historical facts and Thanksgiving trivia. Get free resources with suggestions for tie-in activities and downloadable reproducibles, including an “I am thankful for” list for students to complete, notes for kids to convey gratitude, and more. Click here. Zoo-Wee Mama! Just out today—there’s also a brand-new book in the Diary of a Wimpy Kid series. In Old School, book 10 of the series, Greg sees if he can survive without electronics. You can get a free event kit with games, activities, and suggestions for the book. (I got a chuckle out of the “Fakebook wall.”) Check it out here! As a teacher, you’re in the education business every day. But what about your own education? The American Public University Master of Education: Teaching program meets the needs of licensed practitioners by linking effective teaching and best practices in the classroom. And now the program includes concentrations in Autism Spectrum Disorder and STEAM (STEM plus the Arts). Enrollments are under way. Get started at Studyatapu.com/learning. Don’t forget; post a comment for your chance to win the books. PS: You’ll always finds great resources, freebies, and contests at LearningMagazine.com. Check them out! Love all the resourses especially the Disney and the books. I would love. 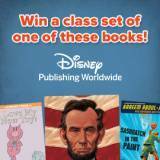 I really liked the Disney publishing book giveaway. I also liked all of the resources that you could get for each of the leveled books. Oh the Judy Moody books seem like such fun. I think the classroom teachers would really enjoy sharing the information from a historical perspective with their classrooms. thanks for all that you do to enrich our classrooms! Any of the titles sound exciting, especially “The Very Stuffed Turkey” and my kids will love it. I also signed up for the free Disney giveaway. Thanks. I love all the activities to go with the new Diary of a Wimpy Kid. I know a group of sixth graders that this would be a huge hit. My students LOVE Diary of a Wimpy Kid!! Just downloaded the Free event kit for Wimpy Kid Old School plan on using kit with our next bookfair. Wimpy Kid wins this month. I love the Thanksgiving theme books! My class loves Diary of a Wimpy Kid. I will definitely be using those materials this month! 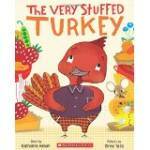 I would love to use The Stuffed Turkey and Sharing the Bread… books for a compare/contrast strategy. So many children are unaware of what life was like many years ago. Thanks for sharing! My kiddos love Diary of a Wimpy Kid! So fun! Looks like some great new books that I will definitely have to get my hands on! I just overheard the sixth graders debating the color of the next Diary of a Wimpy Kid. It was funny to listen to their “book” discussion. Learning about Thanksgiving and turkey culture is always fun and amusing for students. I would have to say The Very Stuffed Turkey and Sharing the Bread, would be my top picks!